They've got magic to do: Penn Jillette and Teller in "Penn & Teller on Broadway," at the Marquis Theatre. Cell phone-seizer Patti LuPone would be horrified with the latest Broadway outing from charismatic illusionists Penn and Teller. 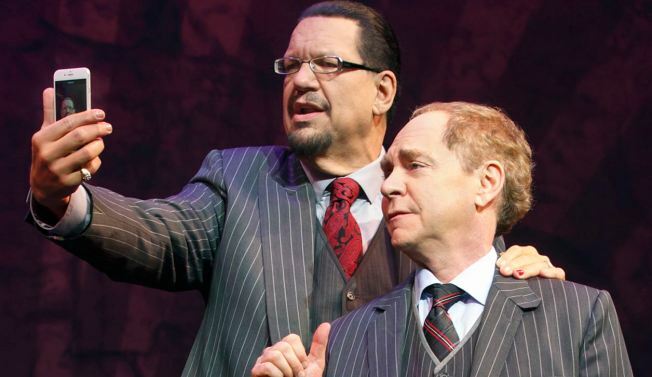 Early during the first bit in “Penn & Teller on Broadway”—the show has just opened for a limited engagement at the Marquis Theatre—Penn, the chatty one, asks the 1,700 or so theatergoers to take out their cell phones and turn them on. An audience member then becomes an amused participant in a trick that culminates with the phone reappearing, as you’d suppose, far from where it was previously seen. Even when the routine was over, I don’t recall Penn ever asking us to shut our phones off. The cell phone trick turns out to be just the first in a relentlessly beguiling retrospective of the duo’s greatest hits, some previously seen during earlier Broadway runs, others from their current Vegas gig at The Rio. The 90-minute act, comprised of nearly 20 skits, is playful, lean and polished. A classic bit, “The East Indian Needle Mystery,” showcases Teller alone. We watch as the quiet magician seems to swallow dozens of needles, and then regurgitates them back out. Teller is also the object of mystery in “He’s a Little Teapot,” which has him turning into just that—a human teapot, and one who levitates, to boot. “Psychic comedian” has Penn criticizing the frauds who claim to be mind readers, and then proving himself a remarkably skilled one. One of the bigger head-scratchers was “The Vanishing Elephant,” which is really about a vanishing cow. That bit is enhanced by a video chronicling life at Penn & Teller’s farcical “African Spotted Pygmy Elephant Preserve,” a wink at the pretense of some of the pair’s contemporaries. The show concludes with a surprisingly sweet monologue by Penn about the importance of allowing some mystery in our lives. It was no doubt scripted and part of every night’s performance, but it comes off as a spontaneous and resonant lesson about thinking less. I’m a Penn and Teller newbie, but it was obvious even before curtain that the pair’s charm is in their accessibility. Ticket holders were invited on stage to add signatures to an envelope that would later factor into another audience participation bit, or to sit inside a wooden box, the same one from which Teller will make his first entrance. Their soft sales pitch establishes trust, and once trust is built, it’s that much easier to pull the wool over our eyes—which the illusionists do, often, with relish and gusto. Keep your friends close, and your audiences closer? It’ll soon be 40 years since the duo started working together. Their act is relaxed and assured, in a way that only time could accomplish. Penn and Teller make you believe the impossible. If you see a heifer masquerading as an elephant around 46th and Broadway, could you drop me a line? I’m still trying to figure out what happened to it. “Penn & Tell on Broadway,” through Aug. 16 at the Marquis Theatre, 1535 Broadway. Tickets: $47-$147. Call 800-745-3000 or visit Ticketmaster.com.